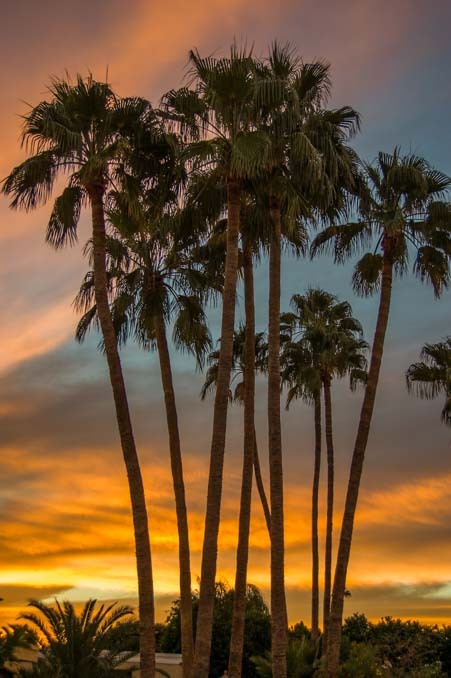 We’ve been very busy around town in Phoenix, Arizona lately, tending to some personal business rather than sightseeing, but the gorgeous Arizona sunsets have made us run for our cameras every time. We were blessed with yet another beauty two nights ago. This one lit up the sky between the palm trees in a friend’s back yard! By the way, this lovely photo is proof that you don’t need a big, expensive, fancy camera to take pretty pictures. Mark took this with my seven year old 6 Mega Pixel Nikon D40. I retired it several years ago, after it had done me great service, including five magazine cover shots. You can find them on Craiglist for less than two hundred dollars. A much better deal, though, is today’s entry level DSLRs which have more resolution and video — the 24 MP Nikon D3200 or the D3300 (which has built-in wifi). It has been really fun for both of us to go back to using this older camera for a while, since our D40’s were our constant companions during our first four years on the road. We’ve learned a lot since then!